The Name with CompareWith type is set in the configuration and can be ASCII, UTF8, LexicalUUID, TimeUUID, Long, or Bytes. In other words in the .NET world they can be string, Guid, DateTime, long, or byte. The Value can only be the Bytes or byte type. And the Timestamp is used for synchronization between Cassandra servers and shouldn’t be directly controlled. To relate back to the type conversion problem that I mentioned above, we need to take a deeper look at what happens to the Value property of the column when it is set and saved. 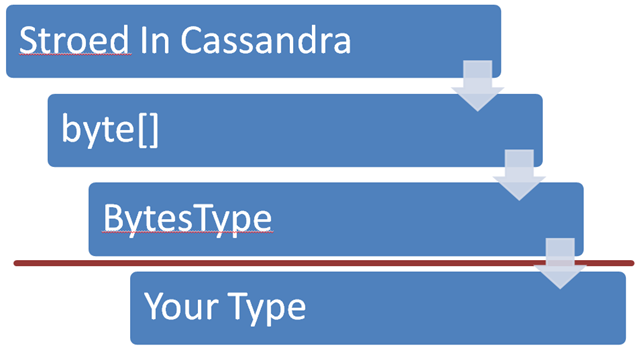 From when you set a property to your chosen type to when it is saved in Cassandra it goes through a two steps that you probably aren’t aware of, first the type is serialized and stored in Fluent Cassandra's flexible BytesType that is intelligent enough to understand how to serialize common runtime types in to binary so that you as the developer doesn’t have to worry about interacting with the Cassandra database at a low level. This intelligent type system is also the major driver behind the ASCII, UTF8, LexicalUUID, TimeUUID, Long, and Bytes type that also help serialize the Name property of the column correctly. 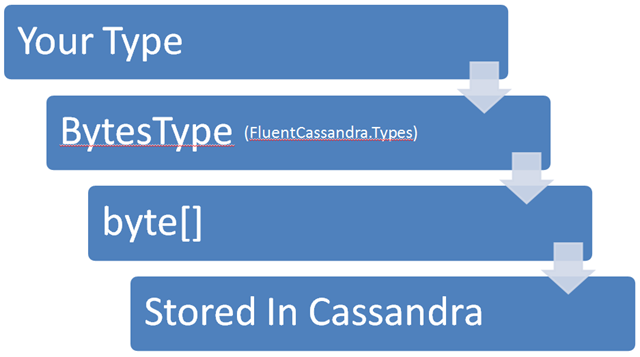 However the issue as alluded to in the beginning of the article comes when you are retrieving the object out of Fluent Cassandra. The act of casting is enough to tell the BytesType object how the binary data should be desterilized in to a runtime type that is understood by .NET. This is all done through a lot of operator magic, but the result is the same. You get the type you entered in to the database out of the database. All other types will throw compiler errors for the time being. I am working on a way to use binary serialization to store other types, but I am not current happy with the interface, because it is not as straight forward as the above. Again if you have suggestions, I would love to hear them.